Access to energy enables people to live the lives that they value. 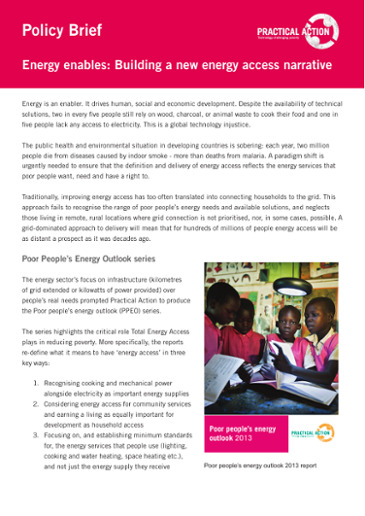 The Poor People’s Energy Outlook (PPEO) 2013 focusses on the vital impact that energy access has on community facilities such as health clinics and schools, and infrastructure services including water and street lighting. From lighting in streets and in the home to power for water pumping, cooking, basic processing and communications, access to energy leads to increased development and improved human welfare. It also transforms health-care provision, enabling vaccines to be refrigerated, implements to be sterilized and diagnostic equipment to be powered. Generating international attention and action on energy for community services is vital if we are to address the fact that an estimated one billion people are served by un-electrified health facilities globally, and more than 50% of children in the developing world go to primary schools without any access to electricity. 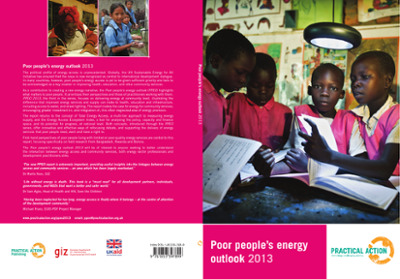 At the heart of the PPEO 2013 is the concept of Total Energy Access. As Practical Action’s approach to achieving universal energy access, this framework requires an understanding of who has access to energy across households, enterprises and in the community - and how that energy is used. This report also contains a refined and developed version of Practical Action’s Energy Access Ecosystems Index, which was first proposed in PPEO 2012 and enables us to understand the environment in which change can happen. The PPEO 2013 also presents global material alongside new insights from Bolivia, Bangladesh and Rwanda, and provides improved indicators that can be used to measure an individual country’s progress towards achieving Total Energy Access. Without access to modern energy supplies there is little prospect of delivering key community services such as health provision, education facilities and other local infrastructure; and, in turn, international development goals will not be achieved. A service-based, rather than supply-based, approach to energy policy and delivery is needed. A definition of access which is based on household connections to the grid will not end energy poverty. Increased financing is needed for decentralised solutions and national plans; and the portfolios of donors, multilaterals and the private sector need to embrace appropriate decentralised energy access technologies. An ecosystems understanding of the energy landscape is important in order to assess and address global and national deficits in policy, finance and capacity. Civil society has a vital role in engaging with SEforAll, as the 'third pillar' of the initiative, along with business and government. Meaningful engagement between civil society and SEforAll can help ensure SEforAll genuinely delivers for poor people.